As a scholarly specialist on the American peace movement, I am sometimes telephoned for background information by journalists writing articles about current demonstrations against war or against nuclear weapons. Almost invariably, they have no idea that the American peace movement has a rich history. Or, if they realize that it does have such a history, they have no idea that that history goes back further than the Vietnam War. This is a very big and unfortunate gap in their knowledge. Actually, the American peace movement dates back two centuries and has involved millions of people (among them prominent figures like John Quincy Adams, Charles Sumner, Abraham Lincoln, Mark Twain, Jane Addams, Robert La Follette, John Dewey, Albert Einstein, Eleanor Roosevelt, and Martin Luther King, Jr.). Another relatively unknown fact is the importance of New York State – and particularly New York City – in that movement’s history. Of course, even before there was an organized peace movement in the United States, there were individual pacifists and peace-oriented Americans. The pacifists, especially, came mostly from three small groups that sprang from the Protestant Reformation: the Society of Friends (better known as Quakers), the Mennonites, and the Brethren. They originally settled primarily in Pennsylvania, where the Quakers established a colony run on pacifist principles. They eventually fanned out across the northern colonies and states, including New York, where they were joined by another Christian religious pacifist group, the Shakers. The first formal peace organization in the United States however, and probably in the world, was not established until 1815. This was the New York Peace Society founded by David Low Dodge, a New York merchant, in August of that year. Dodge was a Presbyterian who, like many other Americans, was horrified by the bloodshed of the Napoleonic Wars, which reached the United States in the form of the War of 1812. 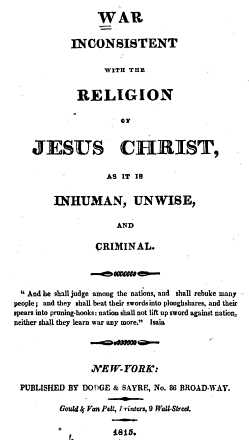 In 1815, Dodge published a small book, War Inconsistent with the Religion of Jesus Christ. In it, he not only catalogued the inhumane aspects of war, but contended that “all who love our Lord Jesus Christ in sincerity cannot but ardently desire that wars may cease.” Thus, they should “immediately renounce everything that leads to wars . . . and embrace everything which would promote that glorious reign of righteousness and peace.” With this in mind, Dodge and his friends founded the New York Peace Society, an organization largely confined to New York City and open to both pacifists and non-pacifists, although the executive committee was limited to pacifists. 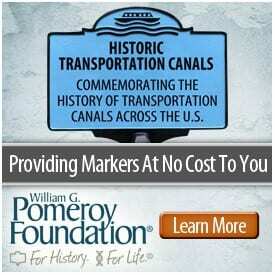 Of the 30 original members, some were clergy and others were philanthropic businessmen. In subsequent months and years, other local peace societies were established in the United States, mostly in the northern states. 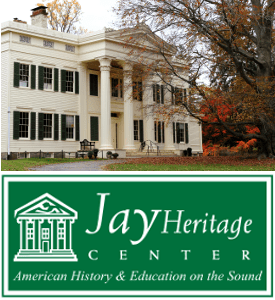 In 1828, they drew together to form the American Peace Society, with the New York Peace Society as a local branch. Much of this early American peace movement faded with the approach of the Civil War. The major reason was that most of the movement’s Northern supporters – people like William Lloyd Garrison, the famed abolitionist leader – rallied behind the Union cause thanks to their keen desire to end slavery. In New York City, however, the Northern cause was considerably less popular. Not only was New York City never an abolitionist stronghold, but the large number of poor, Irish-American workers living there deeply resented the draft, which conscripted them for service in the Union army while enabling the wealthy to escape military service through a $300 payment to a substitute. Eventually, this situation erupted into three days of very violent anti-draft riots. Naturally, the small New York peace movement had nothing to do with this violence, which ended only after the rioters were suppressed by federal troops. But the confrontation did indicate the widespread unpopularity of military service in circles that went beyond the rather elite, Protestant-dominated peace movement of the time. For the most part, the leadership of the American peace movement from the mid to the late nineteenth century came from New England. This included: William Ladd, a former sea captain from Maine who became the first president of the American Peace Society; William Lloyd Garrison, the great abolitionist leader from New England who founded the New England Non-Resistance Society; Elihu Burritt, a remarkably learned blacksmith from Connecticut who founded the League of Universal Brotherhood; and the cluster of late nineteenth century anti-imperialists, with their greatest strength in Massachusetts, who opposed the U.S. conquest and annexation of the Philippines. In the last years of the nineteenth century, the pendulum began swinging back to New York. International arbitration was a key demand of peace proponents, and this idea was taken up by two Quaker brothers, Alfred and Albert Smiley. Beginning in 1895 and continuing for a total of 22 summers, they brought leaders from the ranks of government, business, religion, education, and reform to their resort at Lake Mohonk, New York to discuss international affairs. Here they fostered discussions of international arbitration, international law, and the creation of an international court. Although the New York Peace Society had long ago gone defunct, in 1906 it was re-established and became one of the most powerful branches of the American Peace Society. In 1907, when a National Arbitration and Peace Congress convened in New York City, it was the largest peace gathering in the history of the United States. Its 1,200 delegates included cabinet officers, supreme court justices, senators, the governor of New York, and prominent figures in business and in the labor movement. The onset of World War I, in 1914, led to a great upsurge of the peace movement, especially in New York City. Although the United States was at that time neutral in the conflict, a group of editors, social workers, and religious leaders began meeting at Lillian Wald’s Henry Street Settlement to consider the war and its dangers for social reform. Amid a rising call for U.S. military intervention in the conflict and President Woodrow Wilson’s pressure for a U.S. military buildup, they organized the Anti-Preparedness Committee, headed by Crystal Eastman, in 1915. By 1916, the New York City-based organization had 15,000 members, had distributed over half a million pieces of antiwar literature, and had renamed itself the American Union Against Militarism (AAUM). The new AAUM quickly became the key organization in the nationwide drive to prevent American entry into the world war. In April 1916, it held a mass antiwar meeting in Carnegie Hall, where Lillian Wald was flanked by representatives of the labor movement, social workers, the National Grange, and church organizations. This New York City peace rally was followed by others in over half a dozen other large cities. Although President Wilson ran for re-election that fall, employing the slogan “He Kept Us Out of War,” his actions in early 1917 seemed to be moving the nation toward military intervention. In response to this, the AAUM stepped up its activities, expanded its staff, filled Madison Square Garden with a mass protest meeting, and sponsored antiwar rallies all across the country. But, in April 1917, Wilson called upon Congress for a declaration of war, and most of Congress complied. With the United States now plunged into the conflict, the AAUM crumbled rapidly. In part, this reflected the belief of some of its leaders that, with the Congressional declaration of war, their opposition to the conflict should stop. But it also reflected the fact that the federal and state government now launched a massive crackdown on dissenters that imprisoned thousands of individuals, shut down organizations, censored newspapers, deported critics, imprisoned, tortured, and sometimes killed conscientious objectors, and encouraged vigilante action. At Columbia University and at other educational institutions, faculty members critical of the war were fired. Some of this repression actually had a positive outcome. Faculty organized the American Association of University Professors to safeguard academic freedom through the establishment of tenure. And the new secretary of the AAUM, Roger Baldwin, formed a Civil Liberties Bureau, which became the American Civil Liberties Union. Other peace groups managed to survive the war. Perhaps the largest of them was the Women’s International League for Peace and Freedom. 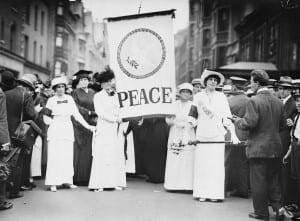 Organized as the Woman’s Peace Party in January 1915 at a meeting of 3,000 women called by Jane Addams (the nation’s settlement house pioneer) and Carrie Chapman Catt (a leader of the women’s suffrage movement), the new organization argued that neutral countries should serve as mediators in the world war. That April, it dispatched a U.S. delegation to the Hague for an International Congress of Women that endorsed the idea of neutral mediation and elected Addams president of an International Committee of Women for Permanent Peace. For a time, Addams and other leaders hoped that President Wilson would implement the idea, and Addams did meet with Wilson to urge this course upon him. After the war, the name of this international organization was changed to the Women’s International League for Peace and Freedom (WILPF). Addams was elected its first president, and the U.S. branch, initially headquartered in New York City, became its strongest. Both Addams and a later WILPF president, Emily Greene Balch, received the Nobel Peace Prize for their work, and the international organization, including the U.S. branch, remains an active part of today’s peace movement. Another long-term peace group formed during the world war was the Fellowship of Reconciliation (FOR), which provided a haven for religious pacifists. Its origin, in 1914, lay in the decision of two friends – one British and the other German – not to be divided from one another by their countries’ murderous military conflict. Launched in Britain, the FOR developed an American counterpart, in Garden City, New York, in November 1915. It members included Quakers, leaders in the YMCA, and social gospel clergymen. Although the Americans did not intend to create an action organization, some of its leaders worked in the broader campaigns against military preparedness and, later, against U.S. intervention in the world war. As the movement spread to other nations, the International FOR was born, with the American branch settling down in New York City. The FOR went on to become the leading voice for religious pacifism in the United States, attracting prominent figures that ranged from Reinhold Niebuhr, to A.J. Muste, to Martin Luther King, Jr. Decades later, the FOR moved a bit upstate to Nyack, New York, where it shed its exclusively Protestant orientation by creating peace fellowships among Catholics, Jews, Muslims, Buddhists, and other religious groups. In 1923, yet another pacifist organization emerged in the United States: the War Resisters League (WRL). Founded by Jessie Wallace Hughan, a New York City schoolteacher and socialist, the WRL was designed to unite political, humanitarian, and philosophical objectors to war. It was developed as the secular counterpart to the FOR, and sought to enroll conscientious objectors with the credo: “War is a crime against humanity. We therefore are determined not to support any kind of war and to strive for the removal of all causes of war.” The WRL was particularly popular among Socialists, anarchists, and independent radicals, and established its headquarters in Lower Manhattan, where it is still located. Like WILPF and the FOR, it became the U.S. branch of a worldwide organization―in this case, the War Resisters’ International. Over the years, many prominent figures have given their public support to the WRL, including Albert Einstein, Bayard Rustin, and Daniel Ellsberg. It has been particularly effective in developing and popularizing the tactics of nonviolent resistance. In 1933, Peter Maurin (an itinerant French peasant philosopher) and Dorothy Day (a longtime writer and leftwing activist) launched the Catholic Worker movement on New York City’s Lower East Side. Although the Catholic Worker movement focused primarily on aiding the downtrodden through the creation of Houses of Hospitality for the poor in the nation’s cities and through the establishment of farming communes in rural regions, it also commenced an unrelenting Catholic critique of war and conscription, heavily publicized through its inexpensive newspaper, the Catholic Worker. In the following decades, America’s Catholic church hierarchy was never quite comfortable with the Catholic Worker movement, particularly its staunch pacifism (which challenged the church’s rather elastic “just war” theory), and a very uneasy relationship usually prevailed between the two. In the meantime, though, Dorothy Day and the Catholic Worker movement helped spark the development of what is often referred to as the Catholic Left. Its best-known adherents are probably Daniel and Philip Berrigan, but it also attracted many radical pacifist priests and nuns. Michael Harrington also drew his inspiration, as the nation’s foremost Socialist and anti-poverty crusader, from employment at the Catholic Worker’s House of Hospitality on the Lower East Side. Of course, there were other peace and peace-oriented organizations – including the American Friends Service Committee, the Committee on Militarism in Education, and the Friends Committee on National Legislation – formed during the first half of the twentieth century. But those discussed here at length were certainly among the most important ones, and they were all closely associated with New York City. Although the American peace movement largely collapsed with the advent of World War II, it experienced a small-scale revival in the war’s aftermath. The Second World War was the most devastating military conflict in world history, slaughtering more than 50 million people and leaving large portions of the globe in ruins. Moreover, it ended with the U.S. government’s use of the atomic bomb to annihilate two Japanese cities – a clear indication that, if nations continued their ages-old practice of settling their disputes through war, the world was headed for catastrophe. These developments not only gave new relevance to groups like the WILPF, the FOR, the WRL, and the Catholic Worker, but served as the backdrop for the dramatic growth of the world government movement. United World Federalists (UWF), founded in 1947, was the largest of the new world government organizations, and, within a few years, it had some 50,000 members in the United States. Calling for transforming the United Nations into a genuine world federation, UWF―headquartered in New York City―had the support of numerous prominent writers, politicians, businessmen, and labor leaders and, for a brief time, had significant clout in state governments and in Congress. But, with the intensification of the Cold War, it experienced a serious decline in membership and influence, as did the smaller pacifist groups. SANE, as it was soon called, launched its antinuclear campaign in November 1957, with a full-page advertisement in the New York Times, headed: “We Are Facing a Danger Unlike Any Danger That Has Ever Existed.” Calling for the immediate suspension of nuclear weapons testing, SANE’s ad declared that the “challenge of the age is to develop the concept of a higher loyalty”―a loyalty “to the human community.” Although SANE was intended by its founders to serve a temporary, educational purpose, the response to the advertisement was so widespread that SANE became a permanent organization, headquartered in midtown Manhattan. By the summer of 1958, SANE had about 130 chapters (about half of them in the New York City metropolitan area) representing 25,000 Americans. Ultimately, President Kennedy called upon Cousins, as the co-chair of SANE, the largest peace group in the United States, to smooth the path for a nuclear test ban treaty with Nikita Khrushchev of the Soviet Union. This effort came to fruition with the negotiation and signing of the Partial Test Ban Treaty of 1963. Given the widespread dismay with the prospect of nuclear war in the late 1950s and early 1960s, other antinuclear campaigns also arose. One of them, in New York City, developed in opposition to civil defense drills, which peace activists criticized as providing no more than an illusion of safety. In 1955, activists from New York City’s pacifist groups began publicly resisting participation in the city’s annual civil defense drill by refusing to take shelter. By 1960, this civil disobedience campaign had been broadened to the extent that approximately 2,000 people resisted the yearly drill. Some 500 gathered in City Hall Park in a standoff with police, while students at City College, Queens College, Brooklyn College, and New York high schools also defied authorities by refusing participation. Faced with this kind of public resistance, the New York City government simply abandoned its civil defense drills. The massive protest campaign against the Vietnam War finally forced U.S. withdrawal from the conflict and an end to the war in 1973. And this, in turn, enabled the American peace movement to redirect its energies toward an issue that had deeply troubled it ever since 1945: the nuclear arms race and the threat of global annihilation. This return to the nuclear weapons issue was accelerated by the revival of the Cold War and the accession to power of hawkish politicians, especially Margaret Thatcher in Britain and Ronald Reagan in the United States. Assailing the nuclear arms control and disarmament measures of the past, the Reaganites promised a major nuclear weapons buildup, depicted the Soviet Union as the source of all evil in the world, and talked glibly of waging and winning a nuclear war. The result was the eruption of the largest, most widespread peace movement in world history. In the United States, older organizations like SANE―as well as newer ones like Physicians for Social Responsibility―grew rapidly. In June 1982, nearly a million Americans turned out for a rally against the nuclear arms race, the largest demonstration of any kind up to that point in American history. Meanwhile, the Nuclear Weapons Freeze Campaign, designed to stop the nuclear arms race through a Soviet-American agreement to halt the testing, development, and deployment of nuclear weapons, drew the backing of most peace groups, major unions, and mainstream religious bodies. Despite efforts by the Reagan administration to discredit the Freeze movement, polls found that it drew the support of 70 to 80 percent of the public. In the fall of 1982, a majority of voters backed the Freeze in nine of the ten states where it appeared on the ballot. In 1984, it was made part of the Democratic Party’s presidential campaign platform. Ultimately, the movement, in the United States and abroad, was powerful enough to transform public policy. Not only was nuclear war averted, but Soviet and American officials, turning from confrontation to an unprecedented love fest, began signing the first nuclear disarmament agreements in world history. Ronald Reagan, who entered office roaring like a belligerent lion, ended his presidency bleating like a pacifist lamb. 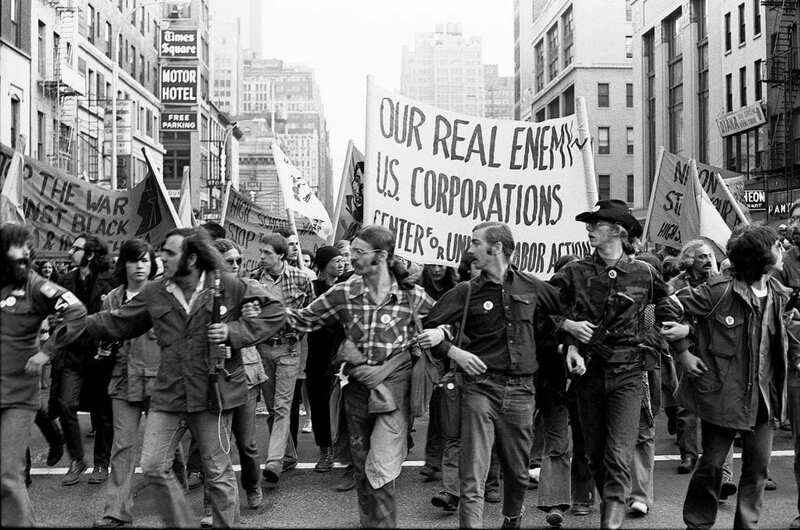 For a number of reasons, the peace movement uprising of the late 1970s and 1980s was less centered in New York than were previous peace movement campaigns. This decline of New York’s central role reflected, in part, the fact that the movement against nuclear weapons had such widespread appeal that it took root in cities and states around the country. But the movement’s ubiquity also reflected a very conscious decision by the leaders of the most powerful new peace movement organization, the Nuclear Weapons Freeze Campaign, to set up their organizational headquarters in the nation’s “heartland,” rather than in more traditional places, such as New York City. Thus, for public relations purposes, the Freeze campaign established its headquarters in St. Louis, Missouri. St. Louis had never been a peace movement stronghold, but it could now serve as a symbol that the peace movement had transcended its New York provincialism to become an all-American phenomenon. 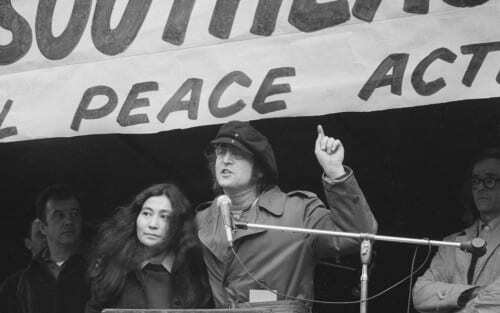 Although there was some truth to the symbolism, the fact remains that New York – particularly New York City – has continued to serve as a key player in the American peace movement. After all, that record-breaking June 1982 antinuclear demonstration of nearly a million people took place not in Missouri, or South Dakota, or Mississippi, or Wyoming but in New York, and specifically in New York City’s Central Park. New York City also invariably provided the site of the peace movement’s largest, nationwide demonstrations against the Iraq War, as well as other large demonstrations championing nuclear disarmament. Moreover, today, New York City, supplemented by other parts of New York State, continues to house the headquarters of numerous peace organizations, including United for Peace and Justice, the FOR, the Catholic Worker, the WRL, Iraq Veterans Against the War, the Jewish Peace Fellowship, the Lawyers Committee on Nuclear Policy, and the Presbyterian Peace Fellowship. National peace organizations establishing their headquarters elsewhere often maintain branch offices in New York City. These include Peace Action, the largest peace organization in the United States, which has its headquarters in Silver Spring, Maryland (just outside of Washington, DC), but whose second largest affiliate, Peace Action of New York State, is headquartered in Lower Manhattan. And, by the way, Peace Action of New York State not only has chapters in New York City, but throughout New York State, from Long Island right on out to Buffalo. All of this brings us to an interesting question: Why has New York played a central role in the American peace movement? Could it be the case that New York State is disproportionately peace-minded because it is the home of a large number of members of two traditionally peace-minded religious groups, the Quakers and the Unitarians? The evidence fails to support this hypothesis. A 1990 study found that only 4,346 Quakers lived in the State of New York, and that they comprised only about .02 percent of the state’s population. Quakers in Indiana, a state with a much smaller population, were far more numerous, but Indiana has never been a center of peace movement agitation. The same study found that Unitarians were more numerous than Quakers in New York State, numbering 13,648. But this still meant that they only comprised about .08 percent of the population, and that New York placed far down on the list of states with a high percentage of Unitarians. A more significant factor is probably New York’s cosmopolitanism. New York has always had a relatively large immigrant population, and the international values such immigrants have brought with them to the United States have probably cooled the nationalist fervor that has so often undergirded wars against other nations. New York City, of course, with its Statue of Liberty, has long provided a particular haven to people from other lands. And, even today, New York and California are the two states in the nation with the largest percentage of immigrants in their population. The location of the United Nations in New York City reinforces the city’s cosmopolitanism and, also, provides a focal point for demonstrations against wars and in support of disarmament. The UN special sessions on disarmament of the past, as well as the nuclear Non-Proliferation Treaty review conferences, have inspired mass meetings and major demonstrations in New York City calling for nuclear disarmament. Another explanation for New York’s importance is its large population. New York City has long been the nation’s most populous urban center, while, until fairly recently, New York State has had the largest population of any state. 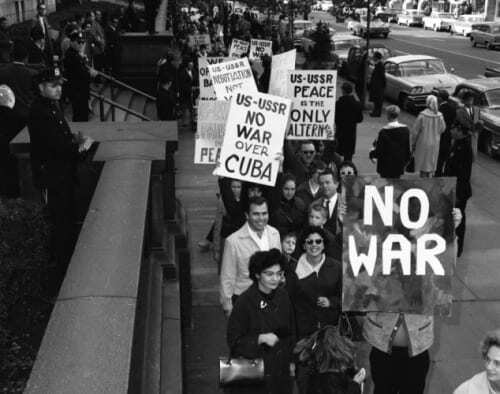 It is not surprising, then, that peace organizations would set up their headquarters in New York City or that they would choose that city for their nationwide peace and nuclear disarmament rallies. Nevertheless, population is clearly not the only factor behind New York’s prominence in the peace movement. Other large American cities―including Los Angeles, Houston, Phoenix, San Antonio, San Diego, and Dallas―have never been hubs of peace movement activism. Also, when it comes to states, California now has twice the population of New York, while Texas is more populous and Florida has roughly the same population. If population explained everything, then peace activism in Texas and Florida would rival or surpass that of New York. But that is not the case. Yet another factor behind New York’s prominence in the American peace movement is its large educated middle class. Scholars who have studied the peace movement in the United States and elsewhere have often called attention to that movement’s disproportionately large educated middle class constituency, particularly in what are called the helping professions. And, in fact, teachers, students, social workers, librarians, clergy, artists, writers, scientists, lawyers, healthcare workers, and civil servants have provided the backbone of the American peace movement. New York State, especially New York City, is blessed with a very large number of educational institutions. In addition to the many fine private colleges and universities in New York, the State University of New York is the largest higher educational institution in the United States, while the City University of New York also employs and educates very large numbers of New Yorkers. As a result, New York has an unusually large educated middle class, the key constituency of the American peace movement. Finally, New York’s relatively liberal values and politics also help to explain the state’s prominence in the peace movement. Peace movement membership and activism in the United States have for many years roughly correlated with the progressivism of the region. Thus, not surprisingly, the peace movement has been weak to non-existent in the reactionary states of the Old Confederacy and strong in the Northeast, the Middle West, and on the West Coast. Those areas of strength are pretty much where Peace Action, the largest peace organization in the United States, has its state and regional affiliates today. In fact, the two largest Peace Action affiliates are in California and New York. New York State, of course, is one of the most liberal states in the nation (as is California), and New York City provides the core of the state’s progressive politics. 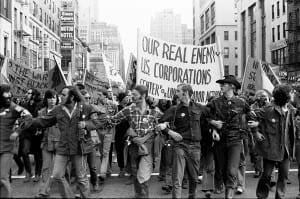 Indeed, New York City has long been a center of dissident groups and ideas, with organizations championing socialism, anarchism, unions, women’s liberation, racial equality, gay and lesbian rights, and other causes. Peace activists fit rather nicely into this reformist milieu. What, then, can we conclude? First, it seems clear that New York State – particularly its largest city – has played a central role in the long history of the American peace movement. Of course, peace activism has emerged throughout the United States. But it has never been distributed equally. Second, New York’s prominence in the American peace movement seems to reflect a variety of factors, most notably its cosmopolitanism, its large population, its educated middle class, and its relatively liberal political culture. So watch out, all you Americans out there in the provinces! As you always feared, New Yorkers are engaged in a great conspiracy – a 200-year conspiracy to create a more peaceful world. Photos, from above: Vietnam Veterans Against the War take part in an anti-war march in the city of New York; title page of War Inconsistent with the Religion of Jesus Christ (1815); a 1914 NYC Peace Protest; NYC Peace Protester at the time of the Cuban Missile Crisis; and John Lennon and Yoko Ono at a Peace Rally in 1972. Good article. However, the first place that The Society of Friends was establlished was Massachussetts Bay Colony in Sandwich 1657 well before William Penn established Pennsylvania. 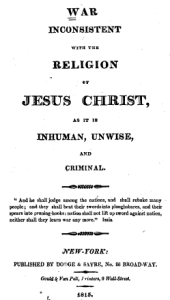 Here is a wiki article https://en.wikipedia.org/wiki/Quakers_in_North_America, I’m sure you can easily find more substantial references.